Have you found an online vendor selling Ko Hana KOA? Koa means "warrior." The same aging regimen as the Koho, bottled at barrel strength: 61.6% ABV. More power, and more funk. Fantastic. As a colleague jokingly said, "So this is the same as Koho... why do you put water in it?" But these rums really do shine at 45% and above, so it's a shame the white ones are generally only bottled at 40. Hopefully that will change. I tried this along with the KOHO rum, and I found the KOHO to be better IMHO. This is somewhat hot at 61.6%abv, which is fine, but it doesn't have the sweetness of the KOHO rum. It's a bit dry for me. 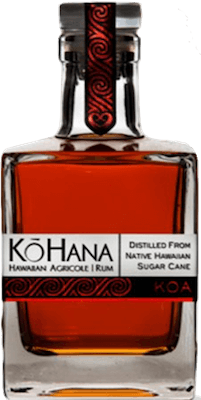 Not bad, but if you only try one rum from Ko Hana, try their KOHO, which a great agricole. Smells and tastes of spice, sugar cane, oak, and honey. Again, just a bit dry and over-spiced for my personal liking.